Some 400 researchers and practitioners met in Vienna, Austria for the 9th European Conference on Research and Advanced Technology for Digital Libraries (ECDL 2005) 18-23 September 2005. The conference offered a fascinating program, starting with a set of six tutorials on Sunday, covering general concepts and formal frameworks for digital libraries, context-enhanced digital library services, thesauri and ontologies in digital libraries, building digital library collections with Greenstone and DL interoperability standards. This was followed by a dense 2 1/2 day program of presentations. The first keynote speaker was Neil Beagrie from the British Library and the Joint Information System Council, UK, who addressed the potential of personal digital libraries, considering specifically the massive amounts of data that are and will be collected by the population at large as part of their day-to-day life, and the resulting potential and consequences for personal information systems. The second keynote by Erich Neuhold, former head of Fraunhofer-IPSI, now Vienna University of Technology, picked up this topic and pointed out future directions in DL development, focusing particularly on the promises and challenges of integrating and combining DL, peer-to-peer and GRID technology. 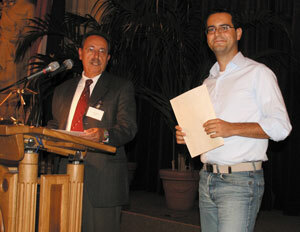 Costantino Thanos, DELOS Scientific Coordinator (left) is handing over the DELOS Research Exchange Award for the best paper presented by a young author, to Christos Tryfonopoulos for his paper "LibraRing: An Architecture for Distributed Digital Libraries Based on DHTs". The quality of the presentations, held in two parallel sessions, was excellent, with only 32% of all papers submitted to the conference having been accepted for presentation. In addition to the presentations ECDL featured two panels. Donatella Castelli discussed with a prominent group of panelists one of the key messages addressed in the second keynote, namely whether digital libraries on the GRID will turn out to be hell or heaven, whereas Tamara Sumner tried to answer the question whether e-science needs digital libraries. The whole range of current digital library research as well as project activities were presented in a poster session, featuring both research posters, application demos, as well as current project activities of the DELOS Network of Excellence on Digital Libraries. Furthermore, a large group of PhD students had the chance to present and discuss their work not only within the ECDL Doctoral Consortium, but also with the whole ECDL community as part of the poster session. Following the main conference program, ECDL was rounded off with a set of well-attended workshops. CLEF, the cross-language evaluation forum, drew more than 100 participants during its two and a half days of presentations and evaluation sessions. IWAW, the ECDL Workshop on Web Archiving and Digital Preservation was extended to fill an intensive two-day program this year, with about 60 participants. Both the NKOS Workshop on Mapping Knowledge organization Systems, as well as HDL, Healthcare in Digital Libraries, ran in their successful 1-day form, soliciting intensive discussion. ECDL 2005 prooved to be a splendid opportunity for people to meet and discuss current core aspects of digital library research. We are looking forward to continue these discussions at the 10th aniversary of ECDL, which will be held September 17-24 2006 in Alicante, Spain.